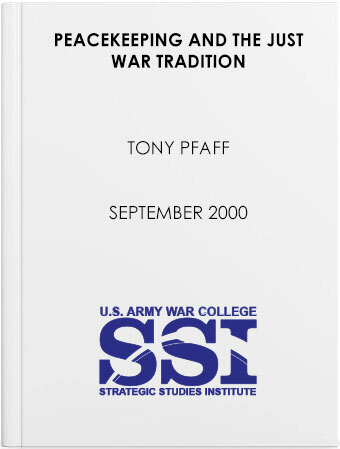 Major Tony Pfaff, a former Assistant Professor of Philosophy at the United States Military Academy, addresses an important source of much of the confusion that currently surrounds many of the Operations Other Than War (OOTW) that the military finds itself participating in with increasing frequency. The author points out that, though the source of this confusion is primarily ethical, it has important operational implications as well. In the Just War Tradition, as well as the Law of War, there has always been a tension between winning and fighting well, and the peacekeeping environment does not change this. Commonly, the resolution of this tension is expressed in the maxim: always use the least amount of force necessary to achieve the military objective. This maxim applies, regardless of what environment one is in. The author's contention is, however, that the understanding of necessary is radically different in the peacekeeping environment than it is in more conventional operations. Failure to understand this results in a great deal of confusion as soldiers try to apply an ethic designed for dealing with enemies in environments where there are none.